Product #55493 | SKU AUV310-64G-RGD | 0.0 (no ratings yet) Thanks for your rating! Cap-free for less mess, super light, featuring a neat mount for straps, and most importantly covered in an elegant texture on all sides. 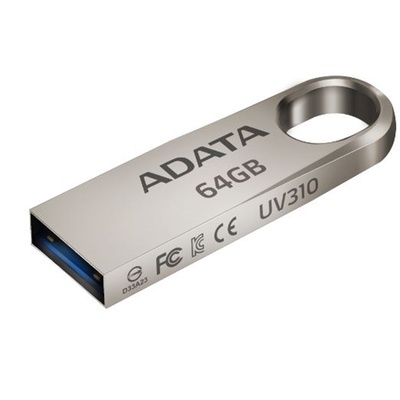 The ADATA UV310 64GB USB 3.1 One Piece Flash Drive has been made in a durable one-piece zinc alloy design for a combination of looks and toughness. It's also cap-free for less mess, super light, featuring a neat mount for straps, and most importantly covered in an elegant texture on all sides.